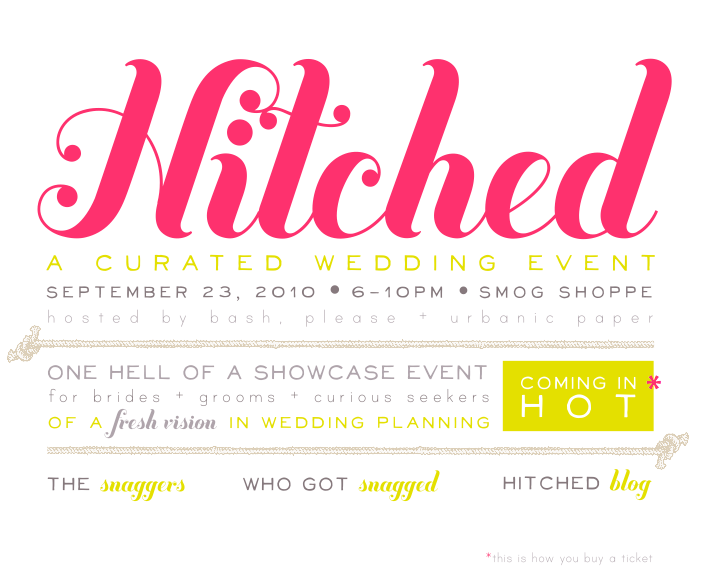 I'm so excited to be attending Hitched tonight! My mom is going to take care of Joie Baby (or should I say "Joie Little Boy" now?) so I can go. So lucky she is visiting from Hawaii! I'll try to remember to bring a camera so I can share the event. Ok folks, this is the last pre-holiday show for Joie Studio! 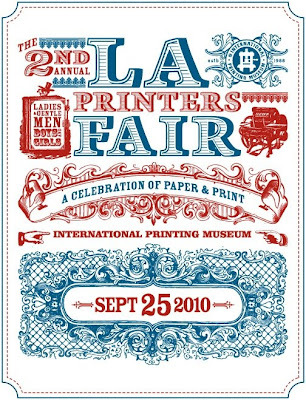 It's this Saturday at the International Printing Museum from 9a to 5p. It's $5 entry (students $4) and it'll be worth every penny! 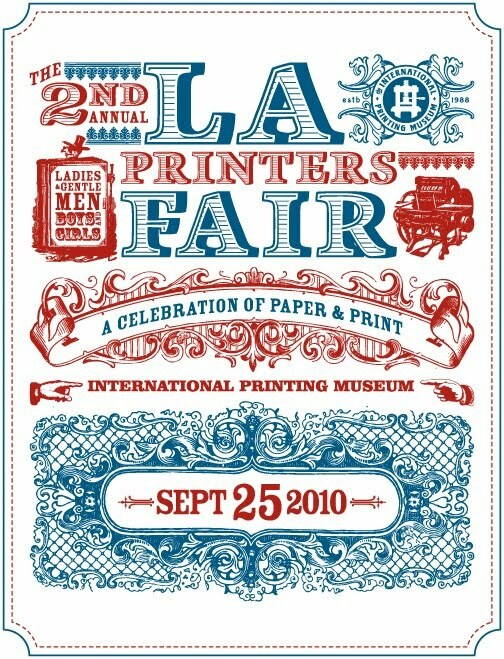 If you ever wanted to know about the process behind letterpress printing, you really need to go to the fair on Saturday. I will be there along with my friends from Keldon Paper, Ramco Rollers, and Fugu Fugu Press, not to mention many other letterpress friends, colleagues, and suppliers! For more information, please see the International Printing Museum's website. While I was in San Francisco, I was introduced to the Square Card Reader. The reader gets low app ratings on iTunes because the readers are backordered and hard to attain, with waiting times of 3-6 months, but the reader is free and the rates are low for occasional credit card swipers. I think once you've requested your Square Card Reader you have to pretend that it doesn't exist until you actually get yours to save on the frustration of not getting it right away. Imagine what this would do for your yard sale! Willo in the video below has graciously offered to send me a Square Card Reader to try out, so hopefully I will get it before the Printer's Fair this weekend and I'll let you know how it works out! Congratulations to Erin and Mike! Erin and Mike were really open to one of my favorite beach color schemes: aqua and gold! Erin wanted starfish on the invitation, so we worked in our Marbella swirls with some sweet little starfish to give her a perfect beach themed letterpress wedding invitation! I hope you enjoyed the starfish letterpress wedding invitations with the beach themed colors as much as I enjoyed designing and printing them! Congratulations again to Erin and Mike! Our collaboration with Shop Toast is creating wonderful things. Honey Bunnies and Hootie Cuties are the first two of four in the Woodland Creatures collection. Shop Toast and Joie Studio have wonderful things in the works, including the next two woodland creatures, one in queue here at Joie Studio, one still being incubated at Shop Toast. The two letterpress art prints are available in Joie Studio's Etsy shop, from Shop Toast, and of course at Joie Studio's booth at J-Pop Summit this weekend and at the Los Angeles Printer's Fair next weekend. Here it is - our very special item for sale at J-Pop Summit! I checked the boxes last night and they're gorgeous and ready to be a great gift for someone special! Filled with Jelly Belly gourmet jellybeans and cute as cute can be and they correspond perfectly with the Love Fruit letterpress cards. We've got a super limited supply so get them while they last. Love Fruit Pops Available at J-Pop Summit! This is going to be our first official non-letterpress item for sale at a craft fair ever, and it hails all the way from Hawaii from our friends at Shop Toast. Tying in very nicely with the Love Fruits letterpress cards are the Love Fruit Pops! 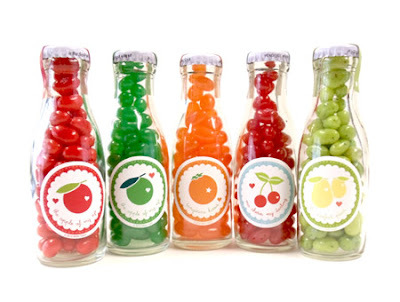 Each of these glass bottles are filled with delicious Jelly Bellys. I will have a very limited number of Fruit Pop gift sets (one of every flavor) packed in a gorgeous gift box available at Bazaar Bizarre J-Pop Summit in San Francisco, so get them while they last! 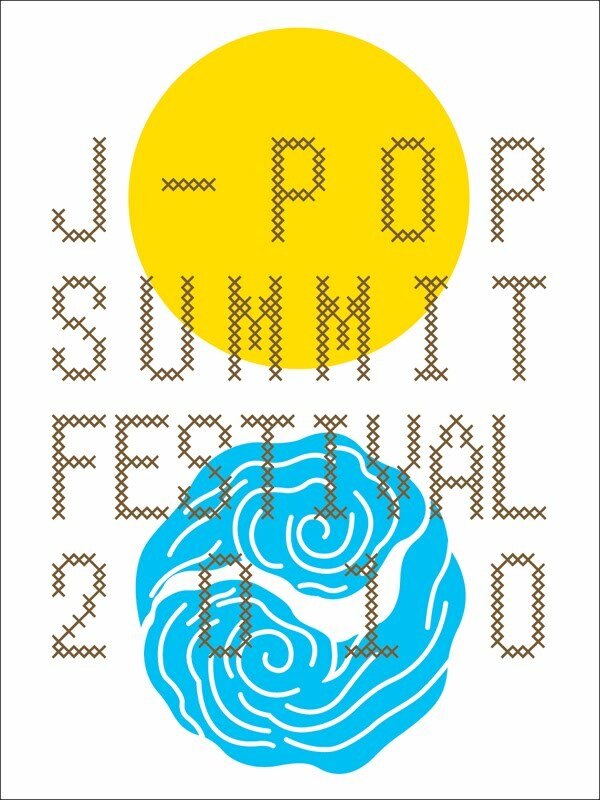 Joie Studio at J-Pop Summit in San Francisco This Weekend! ROAD TRIP! I'm leaving LA on Friday for San Francisco! 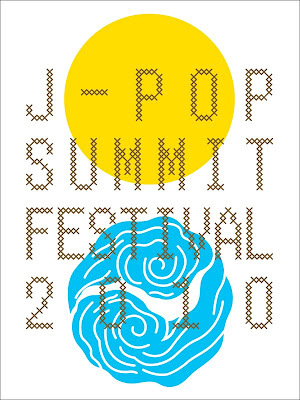 Joie Studio will be setting up shop at Bazaar Bizarre's J-Pop Summit this Saturday! Come by and say hi and pick up some of our newest cards and art prints. And, all the way from Hawaii, we will also have a very special product available for sale from our friends at Shop Toast! More on that on Thursday! Sneak Peek at the Hootie Cutie Patooties! Here is our latest collaboration with Shop Toast. Our friend Michelle at Shop Toast is awfully fond of using many many colors and exact color registration. Not just tight color registration. Exact color registration. Four handcrafted ink colors have been on and off the Vandercook to create these cutie patooties. They are a just a small part of a bigger picture. Are you loving the super exact registration there? Because believe you me, I certainly was not in love with the super exact registration when I was printing these darling creatures. I worked with the ever wonderful Jennifer Olmstead on this gorgeous invitation suite, which had a deep purple paired with slate grey. I will tell you now, dark color + large solid areas is no easy feat for letterpress. 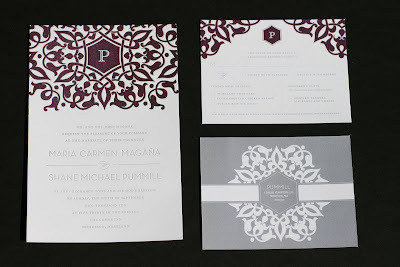 And these cards are rather interesting in that only the invitation is letterpress printed. To save on time and cost, the response postcards were flat printed on the same Reich Savoy 118lb 100% cotton paper that the invitation was. 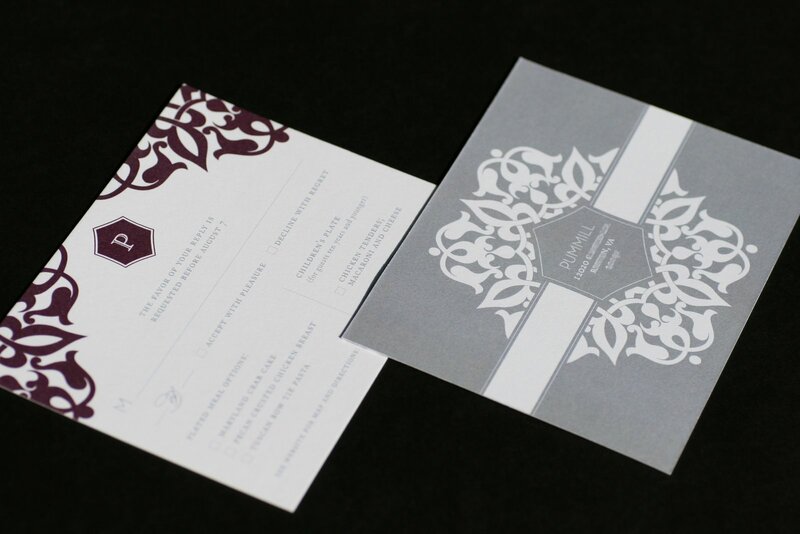 Using the same paper helps to make the invitation suite more cohesive when different methods are selected for different pieces. I hope you enjoyed these wedding invitations! Congratulations again to Carmen and Shane!